Microsoft touted Windows 10 S as new experience in terms of modern classroom collaboration; with features in Minecraft and mixed reality to spark creativity; and a range of Windows 10 S PCs for K-12 classrooms; and the perfect Windows 10 S device, Surface Laptop for college students. Windows 10 S applications are exclusively from the Windows Store, where they are first verified for security, and the anti-malware technology make apps to run in a safe “container”, to ensure consistent performance. And as Windows 10 S powered devices boot-up in seconds, it makes for faster loading and consistent performance, enabling everyone in the classroom to start learning quickly, and stay focused without distraction. With new features in Microsoft Edge like the new Tab Preview Bar which makes it easy for students to research and manage school projects, and the Windows Ink, students can easily make notes directly on a web page and share with a classmate. To compliment all these, the Set Up School PC app in the Windows Store, will enable set up of entire classrooms devices with customized experiences using a USB stick, in as little as 30 seconds for each device. 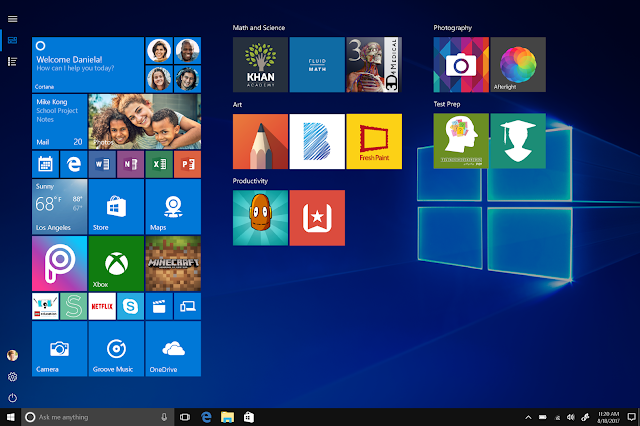 While administrators can easily switch to Windows 10 Pro; which enable them to download any app from the Internet, as when a user is running Windows 10 Pro they can install anything. And the Teams feature will help teachers to bring in rich and engaging content from the web, guest speakers, and solutions from education partners. In the coming months, Microsoft promised offering a range of Windows 10 S devices — from powerful and affordable Windows Ink and touch PCs to beautiful premium devices through its partners.